This piece is simultaneously a homage and contemporary criticism of Judy Chicago’s “Dinner Party” installation. 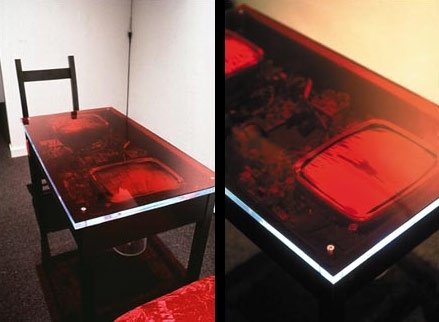 The place settings are composed of two video monitors situated beneath red Plexiglas. These monitors display female genitalia. Scrolling over these shots is text that locates various women who Judy Chicago neglected to invite to her party. Some of these women include Emma Goldman, Lizzie Borden, Mary Read, Lucille Ball, and Valerie Solanas. Viewers activate vibrators embedding in the chairs when they sit down.